Mat Belcher in the winning team of 2018 Etchells World Champions! At the end of 1972, the International Yacht Racing Union (I.Y.R.U. 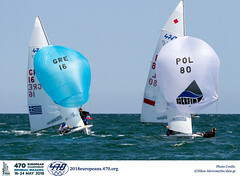 ), the world governing body for the sport of sailing, selected the 470 Class for the double-handed dinghy event open to both men and women sailors for the 1976 Olympic Games of Montreal (Canada). Almost 60 boats took part in the first pre-Olympic regatta organised in 1975 at the same venue as the Olympic regatta in Kingston. 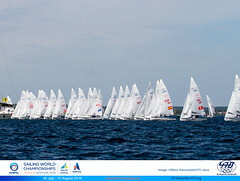 The winners were the French mixed crew Jean-François and Claire Fountaine. One year later, Frank Hubner and Harro Bode, from the former Federal Republic of Germany, won the first 470 Olympic regatta in which 28 nations competed. The I.Y.R.U. renewed the 470 Class as an open event for the Olympic Games of Moscow (former USSR) in 1980 and Los Angeles (USA) in 1984, and then decided at the end of 1984 to split the open event in two, one dedicated to the men crews and one dedicated to the women crews, for the 1988 Olympic Games of Seoul (South Korea). Since that time, both men and women 470 Class Olympic events have been renewed every four years by the I.Y.R.U. and then its successor, the International Sailing Federation (ISAF). These two 470 Class events will be part of the Olympic regatta of the 2020 Olympic Games of Tokyo (Japan). Australia (5 Gold, 1 Silver and 1 Bronze) has been the most successful nation before Spain (4 Gold and 2 Silver) and USA (2 Gold, 4 Silver and 2 Bronze). 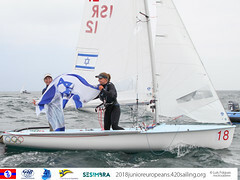 Only two sailors, Theresa Zabell from Spain in 1992 and 1996 and Malcom Page from Australia in 2008 and 2012, have succeeded in winning two Gold medals, but with different crew members.